In the spring of 1975 I had just graduated from the now-defunct NASDS diving instructor college in San Diego, but I had no idea how to get my hoped-for career headed in the right direction. I was flat broke and actually spent a few nights sleeping in my car when I miraculously got hired to work at Chuck Nicklin’s San Diego Diving Locker. Contrast my situation to that of Chuck Nicklin. Chuck had owned the Diving Locker stores for years, and he had built the Diving Locker name into an industry standard bearer. 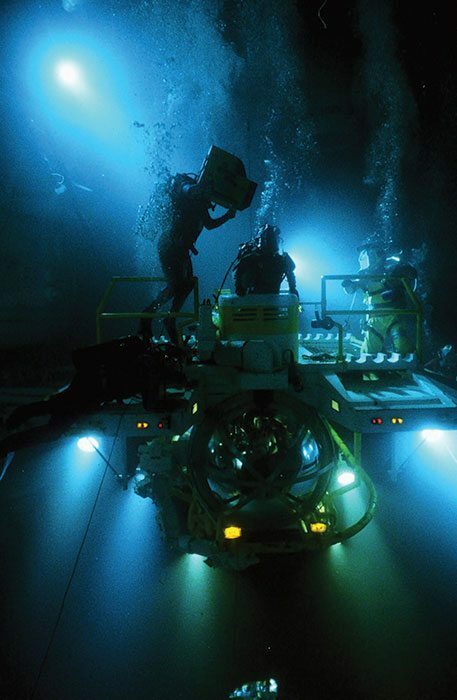 More important to me was the fact that Chuck had also become a very accomplished underwater still photographer and cinematographer. He had shot a number of assignments for National Geographic and by 1975 when I first met him he was shooting underwater on Hollywood films. 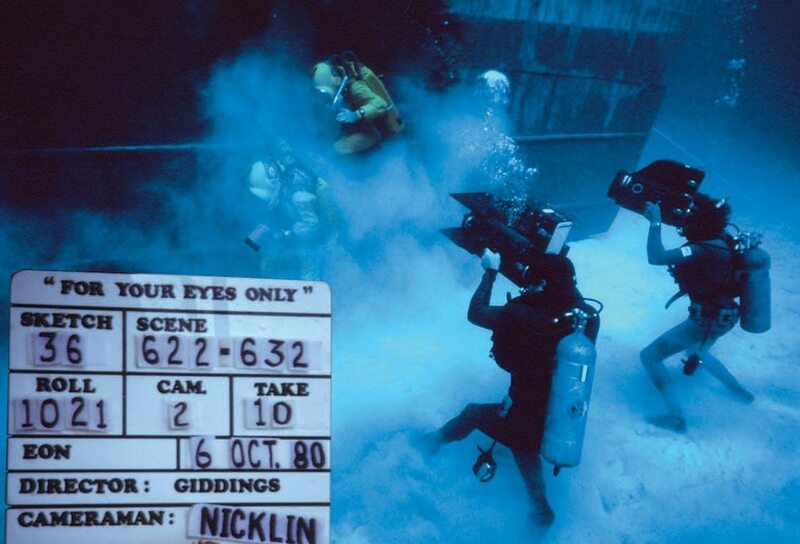 Over the course of his illustrious career Chuck worked as a cinematographer on movies such as “The Deep,” “The Abyss,” the James Bond thriller “For Your Eyes Only,” and the IMAX hit “Nomads of the Deep,” a film about the lives of humpback whales. 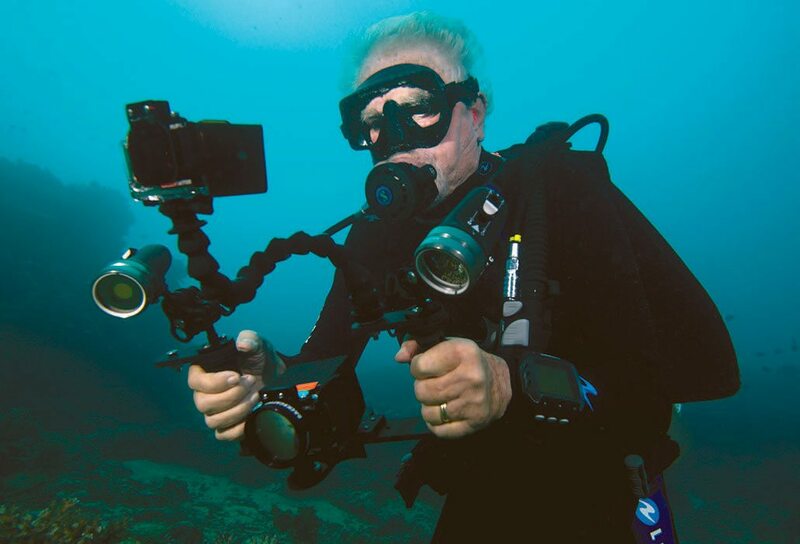 Chuck was one of the movers and shakers in the world of underwater still photography and cinematography. Part of my personal diving dream was to get hired by the San Diego Diving Locker so that I could learn underwater photography from Chuck and his staff, as it was my hope to turn that ability into a career. In essence, I wanted to be like Chuck. Considering where Chuck and I were in our lives in 1975 I never would have imagined that some 40 years later I would enjoy the opportunity to share a stage with Chuck, as I presented him with the 2015 California Scuba Service Award. But that is exactly what happened at this year’s Scuba Show in Long Beach, California. The California Scuba Service Award was created in 1989, and is awarded annually at the Long Beach Scuba Show in recognition of the recipient’s long-lasting contributions to the California sport diving community. The list of previous recipients reads like a who’s who in the world, not only of California diving but in the greater diving community as well, with recipients having made huge contributions in diving safety, education, manufacturing, commercial diving and more. And so it was with great pride that at a Saturday evening function attended by more than 600 people I stood on stage alongside my first boss in the diving business and presented him with the 2015 California Scuba Service Award. And you know what? Now, some 40 years later I still do. When I grow up I want to be like Chuck. The thing about giving this type of awards speech is that when it’s done, there’s usually another thing you wish you’d have said. It seems like there’s never enough time. But I’ll use this space to share with you some of the things that didn’t get said in that fleeting presentation. I suppose many people suspect that an aspiring underwater photographer like me would naturally want to be like Chuck because of his skills as an image-maker, the success and notoriety it brought him, and the crowd of Hollywood stars and starlets he sometimes ran with. I won’t tell you that isn’t true. But I will tell you those reasons are only part of the story. There’s another side of Chuck, the one that makes me want to be like him today. I am going to share some examples of Chuck’s less publicly known side to explain my thinking. Right away I knew I was going to like Chuck. Even if he was only half-joking, and I appreciate that kind of humor. About a month later I got elbowed in the jaw while playing basketball and my swollen face was transformed into a disfigured rainbow. Naturally, I got teased unmercifully at work. In a good-natured way Chuck joined in. But just to be sure I didn’t take it to heart, a few days later on my day off a blue Porsche pulled into the driveway of the apartment I was renting in Pacific Beach. Unannounced, out jumped Chuck Nicklin. I barely knew Chuck. I had no idea what to think. I wondered if I was about to get fired. Other than my dive gear, I had very few possessions. The only piece of furniture to my name was a mattress. No box springs. No dresser. No kitchen table. Chuck rang my doorbell. But I was too embarrassed about the way I was living to answer the door. I just remained still and quiet, waiting for Chuck to drive away. The next day I was scheduled to work in the shop, and I went to work wondering if I had a job. A few minutes after I clocked in, Chuck approached me and asked if I was, in fact, living where he thought I was. I confirmed my address. And then Chuck told me he had dropped by yesterday to see if I wanted to go to La Jolla Cove where a bunch of people were getting together for some volleyball and a picnic. He said he was sorry that I wasn’t home, and apologized for not having given me some advance notice. Nicklin filming in Fiji a few months ago. Notice the size of his camera system is more compact these days. Are you kidding me? The owner, my boss, the cinematographer, the Hollywood hotshot had dropped by to see if his new hire might want to join the gang. Well, that was, and is, the Chuck the public doesn’t know. Over the next couple of years while I worked at the Diving Locker, Chuck loaned me camera gear and routinely shared his photographic knowledge. Before long he invited me to tag along on a handful of shark shoots in the open sea off San Diego just because I expressed an interest. Although, Chuck told me he invited me because I was his most expendable employee; if a shark got me, he figured I wouldn’t be too hard to replace. That, too, was Chuck and his sense of humor. I watched Chuck closely when he was in the water surrounded by sharks. Doing that helped me learn how to dive relaxed and be smart, or at least smarter, diving in the open sea around blue sharks and mako sharks. Those days were incredibly beneficial to me at that stage of my diving career. Do your part, pay attention, never fuss about anything, be appreciative, and Chuck would share his expertise and take you again. That’s Chuck, too. So, yes, like a lot of the guys that worked with and knew Chuck, I wanted to be like Chuck when I grew up. But in my case it wasn’t just because Chuck was the underwater photographer and cinematographer I wanted to become someday, and because he caught the attention of the ladies. I wanted to be like Chuck because he was simultaneously a diving icon, and just one of the guys. He wanted everyone to have fun and feel like part of the gang. Forty years later I see the same qualities in Chuck when I go to the San Diego Underwater Video Club meetings. Chuck is happy to share his experience with accomplished shooters and the newbies alike. I truly admire Chuck’s warmth, his willingness to share and his desire to make sure that everyone feels welcome. This is why when I grow up, I want to be like Chuck.